No matter when or where a person lives, that person must grow up, and growing up involves challenges that are common to everyone. Marjane Satrapi grew up in Iran during the Islamic Revolution—a world away from the southwestern Virginia farm where I grew up—but one of the things that struck me in reading her memoir-in-comic-strips is that some stories are universal. Satrapi’s story does, of course, have extraordinary elements. For example, she knew people who were executed for speaking out against the government, she saw a friend’s body when the house across the street from hers was bombed, she lived independently in Vienna at age 14 so that she could be educated outside the repressive schools she had attended in Iran. But she also wore a denim jacket with a Michael Jackson pin, fantasized about being the next Marie Curie, talked back to her mother, obsessed about boys, got in with the wrong crowd, and sought refuge in books. There’s something in her story that everyone can relate to, and something in her story to shock everyone. The graphic novel approach was perfect for this story. 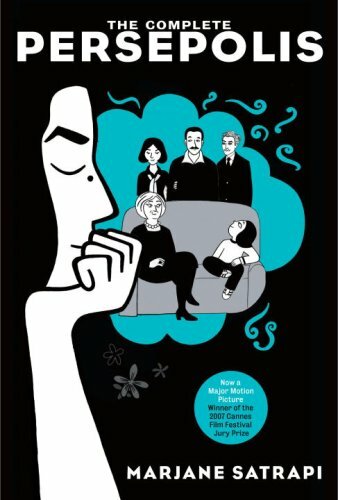 Through pictures, Satrapi is able to convey the terror, the confusion, the pain, and the reckless joy of her childhood and young adult years without indulging in navel-gazing. The picture of a wide-eyed girl in a veil looking alarmed or a girl in Nikes dancing front of a Kim Wilde poster says it all. This is only the third graphic novel I’ve ever read (the others being the excellent Maus and V for Vendetta), and it definitely won’t be the last. Highly recommended. 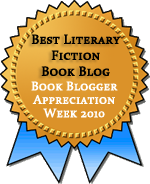 Persepolis won the 2004 Alex Award, so it qualifies for the Book Awards II Challenge. That puts me at five down, five to go. I enjoyed the animated film based on this, but still haven’t got to the actual graphic novel. I’m afriad the form has made me hesitate. Devotedreader–I haven’t seen the film, but it’s wending its way to the top of my Netflix queue. If you liked the film, this might be actually be a great introduction to the graphic novel form. The drawings are very similar in style to the animated clips that I’ve seen. I’ve always wanted to say, thank you, you both write great reviews. Also, that “Persepolis” has only been the third graphic novel I’ve read and I love this format.